You'll be £4.99 closer to your next £10.00 credit when you purchase Exit Plan. What's this? 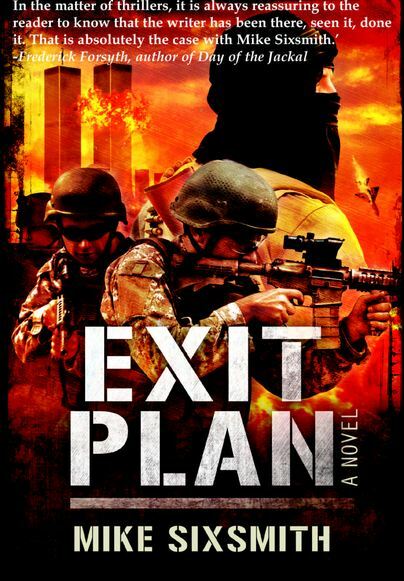 Exit Plan rips the lid off the modern Middle East and The War on Terror like little published before. Terrorism, intrigue and betrayal surge to life with rare insight and colour through the stories of Bill Sloan and Shahid al Sheedi - one an MI6 agent, the other an agent of political Islam. The two men are set on a deadly collision course when an audacious Arab Emirate attempts to acquire Weapons of Mass Destruction. The similarities in the backgrounds of Sloan and Sheedi are soon forgotten as they become embroiled in the ultimate game – at stake is control of the Middle East. Empires will collapse, towers will fall and lives will be lost in this breathtakingly timely and cogent novel. Behind the driving, powerful prose is the mastery of Sixsmith, a man clearly in command of his subject matter who, in Exit Plan, has intelligently condensed decades of regional turmoil into a high-octane thriller. experience lends Exit Plan a legitimacy and a sense that not everything written here is mere fiction. Exit plan reverts back to the mid-90s when I set up a company in Dubai under the auspices of the Dubai government to investigate a major fraud against a government company. In the matter of thrillers, it is always reassuring to the reader to know that the writer has been there, seen it, done it. That is absolutely the case with Mike Sixsmith. In this novel, Mike Sixsmith combines many years of practical experience in security, politics and commerce to produce a book on Middle East tensions against the backdrop of 9/11. Shady businessmen, shikhs, hostages and rescuers all combine to produce plenty of action. Mike Sixsmith's new novel draws the reader into the world of political intrigue, thwarted terrorist plots and international duplicity- reflecting events too often featured in contemporary headlines. This book acts to set our current perceptions of such issues into context. Informed by his own personal experiences, this novel has a real feel of authenticity. His writing explores the lives of the protagonists in these revolutionary conflicts, whose fate is largely determined by an accident of birth. A Protestant child with a middle class background, forced by circumstances to live in a working class housing estate in North Belfast, he joined the British Army. Had he lived on the Shankill Road, it would have been the UDA; or if the Falls Road the IRA. His writing seeks to illuminate these paradoxes; the opposite but parallel lives of those ensnared in such a reality. Sixsmith displays a great depth of knowledge of his subject and a great understanding of the human mind. His characters are drawn with sensitivity and care. It was suggested to me that it was a 'boys' book but it has a much broader appeal than that. It confirms a lot of our view of the middle east and deals with it with a good balance of humour and tension, nailbiting in places. As others have said not always an easy read but one worth reading. Just finished exit plan, and I absolutely loved it. Great action thrills, set against fascinating geo-political canvas, beautifully told. Would recommend to all. 5 stars! At times you have to work hard to understand the background and the first few chapters are difficult but don't give up! This is a lot more than a story. The author has obvious deep background knowledge about the issues he raises which makes for a far more interesting read. He helps you understand the background to middle eastern tensions and why people get sucked into extremism and jihadism. He sets it in real time history that we have all read about. It is a very ambitious first novel to cover such complex issues but it is the fact he tries to that makes it so much more interesting. Your story is really very interesting and full of suspense. I really enjoyed reading it and I wish you a lot of success with it. Well done, I thoroughly enjoyed Exit Plan. It was a most enjoyable and reflective book. The book is a triumph;a riveting read,and is a profound exposition of the tangle of problems we find ourselves dealing with. I write to say how much I enjoyed reading Mike Sixsmith's book `Exit Plan', which I recommend to anyone who wishes to have an insight into the workings of the secret services by a knowledgeable author. I see a future for the main character Bill Sloan. One of those cannot put down books, easy to identify with and up to date with the current situation members of our forces face today. A good read. When`s the film out? A very promising first novel. Mike Sixsmith has a filmproducer’s eye for detail, painting in the sweeping views of Dubai and the Hindu Kush with the same sense of colour, sound and smell that he deploys to describe the more confined scenes in the Souk or the jailhouse. We also get into the mind of the main protagonist, Bill Sloan, - and maybe into the author’s thoughts – about religion used for personal power, about the motivations of jihadists, spies and soldiers on all sides, and into the Byzantine machinations of ambitious, corrupted and corruptible men in the middle east. But Byzantine too is the story he tells. On a first reading the plethora of named characters, particularly the Arabs with names that sound so similar, is a bit daunting. At first the reader is not sure who the actors in each scene are, but as Sixsmith pans across the scene and zooms out, the broader picture becomes clear. The action builds slowly, with fascinating insights into the radicalisation and training of jihadists, theominous reach of the security services and the spirit of Dubai. Without giving away too much, I can say that the closing chapters of the book are a roller coaster ride of suspense. A true action movie of a book. The plot of this interesting novel draws on the authors own experiences of the convoluted politics of the Middle East. Bill the hero is called on to deal with a terrorist plot which could destabilise the whole region. The whole novel is full of political manoeuvrings and is an exciting read. I write to say how much I enjoyed reading Mike Sixsmithâ€™s book â€˜Exit Planâ€™, which I recommend to anyone who wishes to have an insight into the workings of the secret services by a knowledgeable author. I see a future for the main character Bill Sloan. One of those cannot put down books, easy to identify with and up to date with the current situation members of our forces face today.